This family owned Villa has 3 double bedrooms with en-suite bathrooms, 3 twin berooms as well as a family bathroom. All bathrooms use stunning Porcelanosa tiles and fittings including some amazing pedastal baths. The villa has its own swimming pool which is adjacent to a magnificent roof terrace. The villa is situated in one of the most beautiful areas of Spain – the Costa Brava. The Costa Brava is a rocky coastline, plentiful in coves, secluded beaches and little fishing villages. The beautiful beach of Sa Riera, right in the heart of this coast and recognised as being one of the jewels of the Costa Brava, is about 15 minutes walk from the villa. There is also a children's playground which is about a ten minute walk away. Peter and Claudia live in Sevenoaks with our three kids and Twiggy the boxer. Peter was born in Spain and has Spanish family, so always wanted a place in his home land! We have been renting our home out since 2003 and have been on Owners Direct all that time. We prefer to take payments direct in GBP, USD or EUR in order to save our guests booking fees and foreign exchange fees (up to 15%). Feel free to call and discuss if you have any concerns about security of payments. Begur is a short walk from Villa Sa Riera. Begur has cobbled streets, with a large central square surrounded by pavement cafes. There is a great mixture of fine restaurants, tapas bars, and even a fantastic open air pizza restaurant. There are also plenty of late night bars which cater mostly to the style conscious Barcelonians, no English pubs or rave clubs in this town. The Villa is fantastic for one large or two families to share a holiday without getting under each other's feet. There is loads of space, plenty of different seating and dining areas, and beautiful views almost any way you look. The fixtures and fittings are all of great quality and we have aimed to provide people (and ourselves) with luxury and comfort. The other great thing about Villa Begur is that you can walk into town and experience the many fantastic restaurants without having to drive home after a few glasses of wine! We have installed a 32A Commando socket for electric cars to charge which is available for guests to use. The lovely Villa Sa Riera is right next door. All of the bathrooms have been refurbished with top of the range Porcelanosa tiles and fittings. They include... En-suite bathroom to master bedroom. En-suite shower room to double bedroom. En-suite to new double bedroom downstairs. Family bathroom. Lounge and dining room have French windows on 3 sides with fantastic views out to the sea. Two fridges, one large one with ice maker and another one for drinks! Nespresso coffee maker with cappuccino attachment. A welcome pack when you arrive with essentials. Kitchen with microwave, cooker, hob, dishwasher, steriliser for baby bottles, high chair. Plenty of dining options with three different outdoor areas with tables and chairs. Plenty of DVDs with stuff for kids and movies and box sets for adults. PS3 with move controller, lots of fun for all the family! The area is popular with golfers with a choice of 9 superb courses within easy reach of the villa. Notes on accommodation: The villa sleeps 10-12 comfortably in 3 double and 3 twin bedrooms. There is a TV, DVD, VCR and HiFi available. All bedrooms have French windows which lead out onto the balcony. The villa will be fully equipped for families with babies and young children, with travel cot, steriliser, books, videos/DVD and toys. Outside: There are stairs leading up from the back garden to the swimming pool area which is next to an enormous roof terrace with a barbecue area. This is completely private and has terrific views. The photos do not do justice to this terrace, it covers the entire house. It has a full set of garden furniture including an outside table able to seat 10 and sun beds for 8 people. There is also a built-in barbecue with a plumbed in sink next to it. Utility Room: Ironing board & iron, washing machine. Cleaning / Towels / Linen / Maid service: For 1 week holidays 1 clean during your stay. For 2 week holidays 2 cleans during stay in addition to the clean before you arrive. The beach and coastal village of Sa Riera is just 15 minutes walk away. Barcelona (approximately 90 minutes), served by Easyjet from a variety of UK airports. Gerona (approximately 35 minutes), served by a number of charter airlines during the summer and by Ryanair from Stansted. Perpignon (approximately 75 minutes) with Ryanair from Stansted. All the low cost airlines offer cheap car hire from their respective airports. 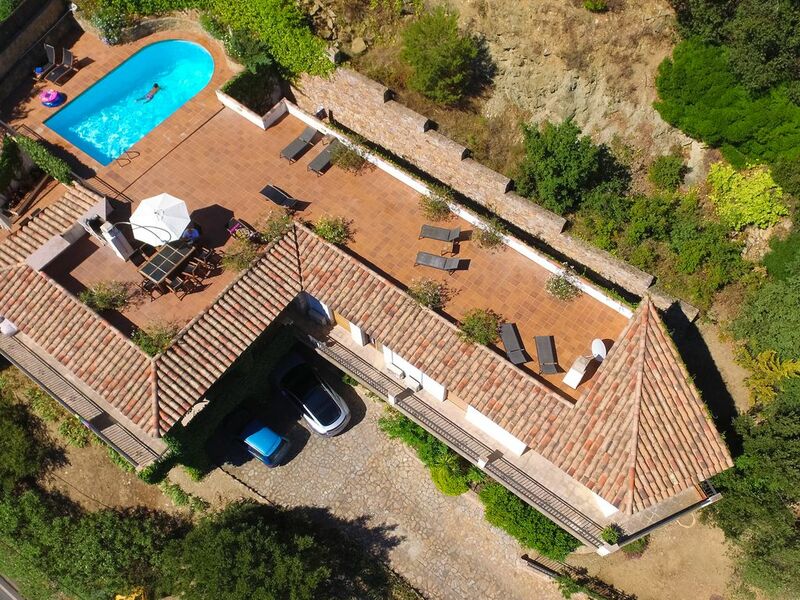 Our villa is just 10 minutes walk from the delightful and picturesque town of Begur, a well-known medieval town. This part of the Costa Brava is much more a getaway for Spaniards than it is a mecca for foreign tourists. In addition to the coast with its many distractions for sun, sea and beach lovers, the area is popular with golfers with a choice of 9 superb courses within easy reach of the villa. It also possesses some of the best diving in Spain, with the only protected national marine park. Other popular activities include walking, mountain-biking and horse riding, all of which are easily accessible all year round. In the winter, one is able to enjoy the luxury of winter sunshine on the coast, with the occasional excursion (2 hours away) to the Pyrenees for skiing. Changeover Day: Saturday - alternative days can be booked by special arrangement.